Donations to the spring food drive at the Atlantic Superstore's Smythe Street location will be accepted between now and April 13. Pictured above, from left to right, are Fredericton's deputy mayor Kate Rogers, Alison Juta, executive assistant of the Greener Village food centre, Elizabeth Crawford Thurber, executive director of the Greener Village food centre, and Fredericton-Grand Lake MLA Pam Lynch. More people have donated food or cash to their local food bank at the Atlantic Superstore outlet on Smythe Street than at any other Loblaw-owned grocery store in the country for a national fundraising campaign, according to officials with the chain. 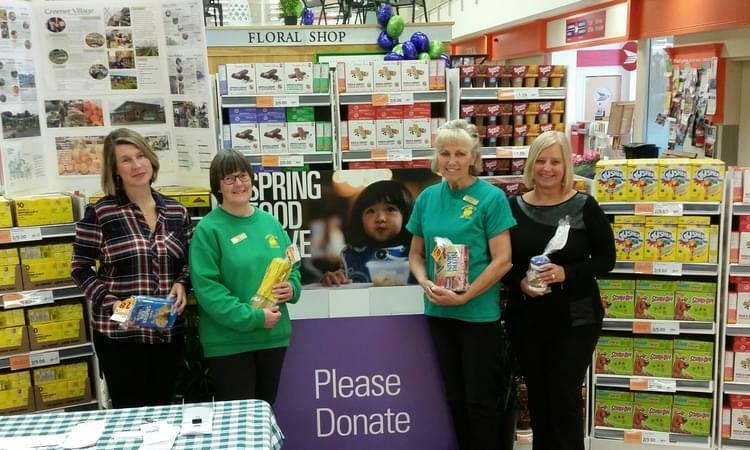 On Tuesday, staff at the Smythe Street store celebrated strong support for their annual spring food drive, which calls on community members to donate cash or non-perishable foods to the cause. The donations collected at the Smythe Street store go to the Greener Village, while the Nashwaaksis Atlantic Superstore will support the Fredericton Community Kitchen, and the Oromocto Atlantic Superstore's bounty will support the Oromocto and Area Food Bank. Nationally, Loblaw Companies Ltd. hopes to raise $1.2 million and 700,000 pounds of food this spring through donations collected across Canada. Since 2009, the company's stores have raised more than $15 million and collected more than 13 million pounds of food for the hungry. Close to 20,000 New Brunswickers visit a food bank at least once a month for assistance, according to Food Banks Canada. Here in Fredericton, officials with the Greener Village Community Food Centre say the number of users has doubled over the past five years, with the facility now distributing more than 1,200 boxes of food products to families each month. Mike Rodrigue, the Smythe Street store's manager, said he hopes people will maintain the momentum generated by year's effort, which continues between now and Apr. 13. "It's not about being No. 1 for [a contest]. It's something that actually impacts our community. Somebody told me a long time ago that you need to support those who support you. We're supported by our customers so I think the fact that we can support the members of the community who are in need is awesome," he said. Since the store began participating in the program in 2012, staff have put together 42,000 gift bags for the food bank. Customers can donate items at the check-out. "That's just shy of $66,000 in food donations alone, outside of the other donations we've made, or the money drives," Rodrigue said. Earlier this week, officials with the Community Action Group on Homelessness in Fredericton released the results of a new survey, which suggested the unique number of stays in local homeless shelters has declined by 31 per cent since 2014. Even though that was a bit of positive news for those who battle poverty in the capital region, Elizabeth Crawford Thurber, executive director of the Greener Village Community Food Centre, said the challenges are still considerable, particularly around food security for the working poor. "People just don't have the money left over to buy food once they've paid their bills, or paid for their power, which just went up," she said. "Everything impacts what you have available for food. That's the volatile part of our financing. You can cut corners there. You can't cut corners and keep your power on. If you don't pay, they'll shut it off. If your kids need something for school, that comes first. That's why we have so many people coming to see us for food assistance." Back in 2007, she said, the facility's food budget was about $70,000. This year, they've set aside $250,000 for food and they're not sure that'll meet all the needs. That's why efforts like the spring food drive are so important, she said. "It's imperative the donations continue to flow. Unless we communicate to the community, and use these campaigns to build knowledge within our community that we're almost feeding 1,300 families, you'll see that we can't do this on our own," she said. "We don't have the money to pay for that increase as the demand keeps growing. So we need efforts like this." Deputy mayor Kate Rogers praised the program. She said until systemic changes can address the root causes of food insecurity and homelessness, many families will struggle to put food on the table. "It's tough with the ever-increasing costs of food. You get your weekly groceries and everything is a little bit more and I often think of the significant costs to families," she said. "It's a real struggle. The expense is high." Fredericton-Grand Lake MLA Pam Lynch, who also attended the launch of this year's food drive, said these kinds of community efforts are critical. "With the way the economy is now, I think a lot of people are losing their jobs and they just can't manage," she said. "People need help. One thing you can say about New Brunswickers is that they always step up to the plate."